Embrace off-grid green living with the bestselling classic guide to a more sustainable way of life, now with a brand new foreword from Hugh Fearnley-Whittingstall. John Seymour has inspired thousands to make more responsible, enriching, and eco-friendly choices with his advice on living sustainably. 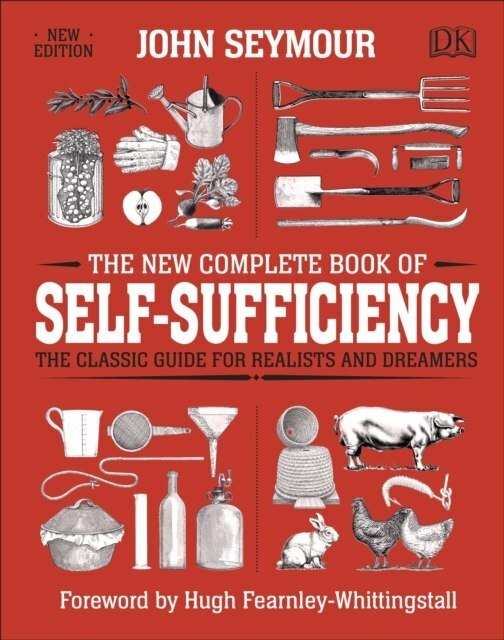 The New Complete Book of Self-Sufficiency offers step-by-step instructions on everything from chopping trees to harnessing solar power; from growing fruit and vegetables, and preserving and pickling your harvest, to baking bread, brewing beer, and making cheese. Seymour shows you how to live off the land, running your own smallholding or homestead, keeping chickens, and raising (and butchering) livestock. In a world of mass production, intensive farming, and food miles, Seymour's words offer an alternative: a celebration of the joy of investing time, labour, and love into the things we need. While we aren't all be able to move to the countryside, we can appreciate the need to eat food that has been grown ethically or create things we can cherish, using skills that have been handed down through generations. With refreshed, retro-style illustrations and a brand-new foreword by Hugh Fearnley-Whittingstall, this new edition of Seymour's classic title is a balm for anyone who has ever sought solace away from the madness of modern life.